The Infoprint 70's flexible attachment capability and excellent reliability enable high-quality printing of e-business applications. Today's e-business applications require a fast, reliable, high-quality output solution that is accessible from virtually any location at any time. The IBM Infoprint 70, when combined with Infoprint Manager, provides Internet-ready output capabilities that allow you to keep pace in an e-business world. With the Infoprint 70, you can produce up to 400,000 impressions per month1, and even complex jobs can run at or near the rated speed of 70 impressions per minute. Advanced controller technology ensures native support for IBM Advanced Function Printing (AFP) and Intelligent Printer Data Stream (IPDS). Page level error detection and recovery capabilities help prevent job resends, minimize human intervention and streamline printing. New imaging technology enhances the appearance of graphics and scanned images, with crisp halftones, improved solid area fill and enhanced gray scale capability. In addition, the printer's flexible multi-resolution support allows users to run existing 240 or 300 dpi applications and print them at 600 dpi. Fulfill challenging user requirements through the printer's large input capacity, robust media handling capabilities and multiple datastream support. An input capacity of up to 6,150 sheets through five trays gives you the ability to choose from different media sizes, weights and stocks including large paper sizes and heavier paper weights without delay. Using Infoprint Manager, you gain support for PostScript and PCL datastreams, allowing you to process jobs from a variety of applications. Note: Letter/A4 (long edge feed) or smaller paper sizes run at up to 70 ipm. Other paper sizes run at up to 35 ipm. 1IBM does not recommend reaching this monthly maximum on a consistent basis. 2Toner package contains six toner bottles and three toner collector bottles. Standard 128 MB of memory, expandable to 256 MB. Standard hard disk for resource storage. Network Interface slot for Ethernet or Token-Ring (TCP/IP only). Excellent 600 x 600 dpi print quality. 3,150 sheets input capacity in four input trays standard. 2,200 sheets output capacity in two output stackers standard. Standard duplex printing, jog function and stapling capability. Variable paper size support up to 12" x 18" (30.48 cm x 45.72 cm). Optional 3,000 sheet High Capacity Feeder. The IBM Infoprint 70 utilizes IBM's advanced controller technology which supports printer resident web pages to view printer and job status and to configure printer settings via a web browser. It comes with standard integrated AFP/IPDS support. This allows the Infoprint 70 to take full advantage of the page level error detection and correction capabilities of AFP. The Infoprint 70 can print even complex jobs at or near rated speed. New imaging technology enhances the appearance of graphics and scanned images, with crisp halftones, improved solid area fill, and enhanced gray scale capability. In addition, the printer's flexible multiresolution support allows users to run existing 240 or 300 dpi AFP/IPDS applications and print them at 600 dpi. Four paper trays are standard and provide a total of 3,150 sheets of input capacity. An optional 3,000 sheet high capacity feeder is available. This improves operator productivity by reducing the amount of time spent loading paper. A large variety of standard and nonstandard paper sizes and paper weights are supported. The Infoprint 70 can staple sets of up to 50 sheets with the standard main output stacker. It is possible to put two staples on the side of each set or put one staple at the top or bottom corner. There is also a standard 200 sheet capacity upper stacker without stapling capability. The Infoprint 70 uses an IBM high-performance controller with a 400 MHz PowerPC 750 processor, IBM printer co-processor, an internal 64 bit data bus, and a 32 bit address bus running at 66 MHz. It has a standard 3.2 GB capacity or greater hard drive and a Peripheral Component Interconnect (PCI) Bus for a Network Interface Card (NIC). The Infoprint 70 controller has flash memory to support printer code upgrade. The Infoprint 70 uses the integrated IBM AFP/IPDS (Advanced Function Presentation/Intelligent Printer Data Stream) standard. A hard drive (3.2 GB or greater) comes standard on the Infoprint 70. DBCS fonts and SEMEA fonts come stored on the hard drive. Fonts and macros may be individually deleted from the hard drive. The Infoprint 70 comes standard with 128 MB of memory. This configuration can support simplex or duplex printing, using AFP/IPDS with SBCS or DBCS. However, additional memory MAY be required to achieve optimal performance. Ethernet interface using the IBM Ethernet 10/100 BaseTX Adapter (feature number 4162). Token-Ring interface using the IBM Token-Ring 4/16 Adapter (feature number 4120). These are mandatory features. One of them must be specified. They are mutually exclusive and there are no pre-requisites for this feature. The Infoprint 70 offers high quality print resolution of 600 x 600 DPI. It supports up to 32 levels of gray for IOCA images. The printer will convert 240/300 DPI AFP/IPDS to 600 DPI in enhanced print mode. The Infoprint 70 uses a new imaging technology which prints single dot lines clearly and produces excellent solid area fill. The maximum monthly usage for the Infoprint 70 is up to 400,000 impressions. IBM does not recommend printing this monthly maximum on a consistent basis. The engine first print out time is approximately 10 seconds for simplex printing (Ledger SEF, Letter LEF), and approximately 15 seconds for duplex printing (Ledger SEF, Letter LEF). First print-out time is the time from when the printer receives a start printing signal in "READY" state until one sheet of paper is printed and delivered. The printer reaches the "READY" state within 240 seconds of power on. The maximum rated engine speeds are as follows (Impressions Per Minute). Note:Heavy media type reduces printing speed. Note:(1) Not supported in tray 1. The maximum monthly usage of Infoprint 70 is up to 400,000 impressions. IBM does not recommend printing to this monthly maximum on a consistent basis. 1      2,3   Tray    HCF   Stack. Stack. Stack. Note:(1) Some print media, although they may conform to size and weight specifications, may still not perform to your expectations. Print quality, jam rates, fuser life and output stacking can be affected by the printing environment (temperature and humidity) and characteristics of the paper (structure, moisture content, smoothness or thickness); refer to IBM Document G544-3915 for paper specifications. IBM STRONGLY RECOMMENDS YOU TEST SMALL AMOUNTS OF PRINT MEDIA USING YOUR PRINTING APPLICATION BEFORE PURCHASING LARGE QUANTITIES OF THE MEDIA OR RUNNING LARGE PRINT VOLUMES. Note:(2) 208 mm maximum stack height. Up to 2000 sheets copier/xerographic paper (20lb/75gsm). Note:(3) 50 mm maximum stack height. Up to 500 sheets of copier/xerographic paper (20lb/75gsm). Note:(4) 15 mm maximum stack height. Up to 150 sheets of copier/xerographic paper (20lb/75gsm). Note:(5) 340 mm maximum stack height. 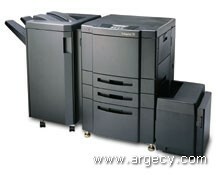 Up to 3000 sheets of copier/xerographic paper (20lb/75gsm). Both output stackers support face-down stacking only. Duplex printing is supported standard. See media type table for media types supported. Duplex printing is not supported with Auxiliary Tray. Stapling is supported standard with Main Stacker. See paper size table for paper sizes supported. Three stapling positions are supported and maximum of 50 sheets can be stapled at one time (up to 80 gsm weight or 5.0 mm thickness). However, this is dependent upon the stiffness of the paper. Jog function is supported by the Main Stacker. Jogging and stapling are mutually exclusive and cannot be selected simultaneously. When both operations are selected, stapling overrides the jogging function. Note:(1) Some print media, although they may conform to size and weight specifications, may not perform to your expectations. Print quality, jam rates, fuser life, and output stacking can be affected by the printing environment (temperature and humidity) and characteristics of the paper (structure, moisture content, smoothness or thickness); refer to IBM Document G544-3915 for general guideline specifications. IBM STRONGLY RECOMMENDS YOU TEST SMALL AMOUNTS OF PRINT MEDIA USING YOUR PRINTING APPLICATION BEFORE PURCHASING LARGE QUANTITIES OF THE MEDIA OR RUNNING LARGE PRINT VOLUMES. Note:(2) Duplex printing is not supported. Note:(3) Using Auxiliary tray is recommended. Note:(4) Letter or A4 size is required. This option provides up to 3000 sheets of additional input capacity. Only letter or A4 paper sizes are supported. Only one of these features can be ordered and there are no pre-requisites for this feature. Infoprint 70 has a simplified operator panel with scrolling capability. It consists of 8 keys, 4 LED status indicators and a 2 x 20 character display. The scrolling of text messages offers enhanced information for the operator. Online - used to take printer online or offline. Enter - used to select an action item or menu item value. Menu (up/down) - used to scroll up or down through menus. Item (up/down) - used to scroll up or down through menu items listed in the message display area. Value (+/-) - used to scroll up or down through acceptable values for menu items. Online - on when printer is online or idle, blinking when printer is receiving or processing data. Paper - on when paper tray is low or empty. Toner - on when toner supply is low. Attention - blinks when printer requires attention. Typical power consumption in Watts, British Thermal Units per Hour (BTU/HR) and Volt-Amperes (VA) are listed below. Note:Infoprint 70 meets the EPA Energy Star specification of 45 Watts or lower. Infoprint 70 ozone emissions are less than 0.02 parts per million (ppm) for an 8-hour Timed Weighted Average (TWA) limit. This is less than the UL 1950 present recommended long term exposure limit for ozone which is 0.1 ppm calculated as an 8-hour TWA concentration. CB Report with all national deviations "TO EN 60950 WITH AMENDMENTS 1, 2, 3, AND 4"
CCIB (China) "CB REPORT MUST INCLUDE IBM AS APPLICANT AND THE IBM MODEL/TYPE"
Note:The Energy Star emblem does not represent EPA endorsement of any product or service. APAR OW27622 for PSF/MVS 2.2.0 is required for multi-resolution (auto) support. The Infoprint 70 supports printer resident Web pages to view printer and job status and to configure printer settings via a Web browser. Public Web pages, end user support and functions (available to anyone with URL or IP address). View printer status, job status and general printer parameters. Administrator support function (available to anyone with password protection). Configure printer and network interface using a Web browser. All operator panel functions are available via Web access. Outline font, 240 pel raster fonts and font resource capture (hard disk). Resolution independent raster font support. Japan Postal bar code support. Partial Arc drawing order support. In addition to the AFP/IPDS enhancements, Infoprint 70 provides a Hard Disk Drive (HDD) standard with preloaded Double Byte Character Set (DBCS) Outline Font Resources. This is a benefit to applications which use double byte characters. Paper orientation (edge/size sensitivity) not configurable. N-up and explicit page placement/orientation not supported. Limited page segment and overlay activation (256). No overlay caching to disk (SDRAM only). Printer resident fonts are supported using outline font technology. Under native mode, all printer-resident AFP/IPDS fonts are accessible to PSF. IBM 4028 Compatibility AFP/IPDS Resident Font Set (supported using outline font technology). To support the BCOCA tower for printing of bar codes, the OCR-A and OCR-B fonts and their corresponding codes pages (892 and 893) must be resident in the printer. These are supported as shown in the "4028 Compatibility AFP/IPDS Resident Font Set" table. Code page 1303 is also resident to be used for 128 bar codes. The following AFP font products are available in resident form as standard in Infoprint 70 printer. These fonts provide 240 pel capability for Japanese, Korean, Simplified Chinese, Traditional Chinese and Thai languages. These fonts are only available in raster form at 240 pel. Though AFP Japanese Font 5771-AGB consists of 23 sizes of DBCS fonts and 20 sizes of SBCS fonts, the SBCS fonts are NOT available in this resident raster font set. The PCL/PostScript Module (features 4820 and 4821) includes Single Byte Character Set support. The PCL/PostScript Japanese Module (features 4810 and 4811) includes Double Byte Character Set support. Included are the Morisawa fonts. This feature should only be ordered if double byte support is required. Features 4820/4821 and 4810/4811 are mutually exclusive and only one of them can be ordered. If the MES version is ordered (feature numbers 4821 or 4811) the existing hard drive will be replaced and the customer needs to download resource fonts again to the new hard drive. Infoprint 70 is supported as an ASCII(PCL) printer via a Workstation Customization Object under the Host Print Transform (HPT) facility of OS/400 V3.2 and higher. Note:(1) Only available in a limited set of symbol sets. PCL fonts are not accessible via AFP/IPDS, nor can PCL access AFP/IPDS fonts. Note:(1) Only available in Courier, Helvetica and Times New Roman typefaces. PostScript fonts are not accessible via AFP/IPDS, nor can PostScript access AFP/IPDS fonts. The following Adobe PostScript 3 resident Japanese DBCS fonts are supported with feature numbers 4810/4811. Network Printer Resource Utility (NPRU) is an application that provides a repository (resource inventory) for fonts and overlays (macros) on a workstation with access to an IBM network printer. Once a font or overlay has been added to the NPRU inventory, it can be downloaded to RAM or hard drive. Some drivers offer font and overlay download capability in the driver. See table below. The font format supported is PostScript Type 1. Fonts and overlays that are downloaded are available to workstation applications when the network printer drivers are selected. NPRU is a separate program that uses the printer drivers to download. Note:(1) Download of truetype fonts is not currently supported. IBM provides the Network Printer Manager (NPM) Utility with an easy- to-use graphical interface for network administrators. Infoprint 70 is supported on NPM version 4.21. NPM runs on Microsoft Windows 95/98/Me/NT 4.0 and Windows 2000 platforms. Network administrators can setup e-mail or pager notifications for Infoprint 70. Whether printers are low on toner, out of paper, or need attention, these notifications can get the information to the right source without delay, improving printer up-time and end user productivity. NPM helps users install and configure IBM network printers in LANs, including Novell networks (Bindery and NDS). NPM monitors printers and provides printer status using the industry-standard, open-systems SNMP (Simple Network Management Protocol) Printer MIB and private enterprise MIBs. The LPR Remote Printing Client utility provides a TCP/IP port monitor for seamless Windows 95/98/Me network printing. This port monitor can be used on Windows 95/98 to direct print jobs from Windows applications to IBM Workgroup printers. This utility supports other printers or print servers that run a TCP/IP LPD print server. The port monitor can be used on mobile systems for remote printing or it can be used on department print servers in an unattended print server mode. This package also includes a command line LPR executable program for printing jobs directly. The LPR program, called IBMLPR.EXE, provides a standard RFC 1179 compliant printing interface and allows the -S and -P parameters to be set by way of environment variables so that drag and drop printing can be enabled for a default printer. Two methods of submitting a print job to the printer are available with Infoprint 70. They are referred to as (pull) and (push) printing. For reference, the conventional method of job submission from a workstation is to select File and Print from an application menu. This process uses a print driver to create a print job which is then sent from the local workstation to the printer. Depending upon the installation configuration, the job may be sent directly to the printer, or to a print server and then to the printer. With pull printing, a browser is used to access a web page in the printer. The user fills in an entry field on the web page with an internet address (or URL) of an existing file to be printed. An example would be a tax form that is available from a government web site. After entering the URL of the file, the user clicks on the Submit button. This submits the URL to the printer. The printer then retrieves and processes the file from the remote server identified by the URL. The file is transferred over the network only once (from the remote server to the printer). Conventional printing of a remote file requires the transfer of the file over the network twice (from the remote server to the local workstation and then to the printer). Supported transfer protocols include HTTP, FTP and Gopher via a proxy server. In order for the printer to reach a server that is on the other side of a firewall, the proxy server must provide access through the firewall. The address of the proxy server is a configuration item in the printer that can be set by the printer administrator. Pull printing provides a one step method of printing existing documents or forms that are available on many web sites. Pull printing can also be used to update the microcode of a printer by entering the URL of the microcode update file. The microcode file can be retrieved over the internet from the IBM Printing Systems web site (www.ibm.com/printers) or from a server configured by the printer administrator. Push printing provides a simple method of printing an existing document on any printer that can be reached with a browser. IPP (Internet Printing Protocol) was commissioned by the Internet Engineering Task Force (IETF) and developed under the guidance of the Printer Working Group printing industry consortium. As such, IPP is better defined than its LPR predecessor (RFC 1179) and is now being adopted as a new standard for printing and job control in networks and over the Internet. Infoprint 70 supports industry standard open-systems SNMP printer MIBs. Novell NetWare connectivity is supported via Token-Ring and Ethernet Adapters as PSERVER or RPRINTER. With a standard hard disk, incoming print jobs can be spooled onto the hard disk if the printer is busy. Other types of jobs, such as PDF files, must be spooled because they cannot start printing until the entire job is received. Other types of jobs (PostScript, PCL) can either be sent directly to the printer or be spooled on the hard disk. Some types of jobs, such as AFP/IPDS files, cannot be spooled because they require communication back to the transmitting host concerning their print status. Infoprint 70 allows the administrator to customize the printer so that all but AFP/IPDS jobs are spooled to the hard disk before printing. In some cases, this can reduce network traffic by minimizing the number of attempts to resend a job to a busy printer. The default spooling setting is to spool all but AFP/IPDS jobs. The setting can be changed on the operator panel or from the printer's Web page. Note:(1) Supported via ISO Latin 1. Note:(2) We do not support ISOAdobeCE. Note:(1) Translated publications availability is based on country translation center commitment dates received from TPS. Note:(1) The operator panel template is translated into all the languages listed here. The translations will be limited to user web pages only. Translation will be available in English only. Power cord based on country code. The Token-Ring feature is an internal adapter that plugs into the controller. The adapter supports 4/16 Mbps Token-Ring. A maximum of one Ethernet or Token-Ring feature may be ordered per printer. The fast ethernet feature is an internal adapter that plugs into the controller. The adapter supports 10/100BaseTX via a RJ-45 jack. A maximum of one Ethernet or Token-Ring feature may be ordered per printer. The Infoprint 70 controller has 128 MB of memory on the controller as standard. One additional 128 MB memory DIMM may be installed. This feature adds an additional input drawer with a capacity of 3,000-sheets. Only letter or A4 paper sizes are supported. A maximum of one of these features may be ordered per printer. The following terms are trademarks of IBM Corporation in the United States and/or other countries: Advanced Function Printing, AFP, AIX, AS/400, AS/400e, IBM, Infoprint, Intelligent Printer Data Stream, IPDS, IP PrintWay, Multiprise, MVS, Netfinity, NetSpool,OS/390, OS/400, Parallel Enterprise Server, RS/6000 and S/390. Microsoft, Windows and Windows NT are registered trademarks of Microsoft Corporation. Adobe and PostScript are registered trademarks of Adobe Systems Incorporated. ENERGY STAR is a U.S. registered mark. The ENERGY STAR Emblem does not represent EPA endorsement of any product or service.